Verizon Communications Inc. VZ continues to deploy the latest 4G LTE Advanced technologies to deliver faster peak data speeds and capacity for customers, driven by customer-focused planning, disciplined engineering and constant strategic investment. With this, the telco’s customers, spread across more than 2,000 markets, can experience the benefits of carrier aggregation while those in 1,100 markets can access 4×4 MIMO (Massive Input, Massive Output) and 256 QAM (Quadrature Amplitude Modulation) in addition to carrier aggregation. Combined, these three technologies significantly enhance the capacity available for customers to use Verizon network and speed at which their data sessions are completed. The carrier aggregation integrates discreet bands of spectrum to ensure data flows between the bands more efficiently. While 4×4 MIMO uses an increased number of antennas at the cell tower and on customers’ devices to minimize interference when transmitting data, 256 QAM enables the devices and network to exchange information in larger amounts, delivering more bits of data in each transmission. Notably, the service provider has achieved 953 Mbps in a real-world deployment in Florida by combining licensed and unlicensed bands with 4-carrier aggregation, 4×4 MIMO and 256 QAM. It was the first carrier to deploy the first end-to-end use of band 48 Citizens Broadband Radio Service 3.5 GHz spectrum in an LTE Advanced carrier aggregation demonstration. Also, it was the first to achieve more than 1 Gbps speeds on 4G LTE network. As such, customers experience the largest LTE coverage in the nation, unrivaled service reliability and the most consistently fast speeds in the telecom ecosystem. The company continues to achieve increased market traction with focus on the retail post-paid market, higher penetration of smartphones and related sale of Internet devices. In the past three months, shares of Verizon have rallied 5.3% against the industry’s decline of 2.4%. 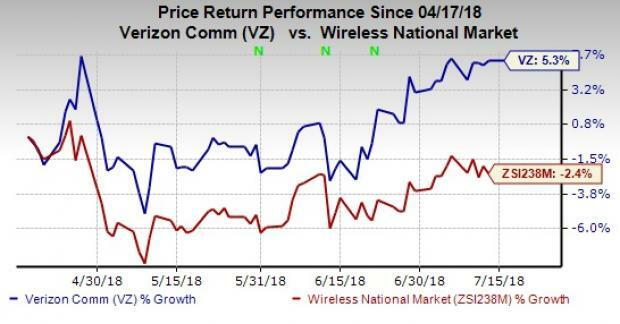 Verizon currently has a Zacks Rank #3 (Hold). Better-ranked stocks in the broader industry include Comtech Telecommunications Corp. CMTL, Micron Technology, Inc. MU and Juniper Networks, Inc. JNPR. While Comtech and Micron sport a Zacks Rank #1 (Strong Buy), Juniper carries a Zacks Rank #2 (Buy). You can see the complete list of today’s Zacks #1 Rank stocks here. Comtech has a long-term earnings growth expectation of 5%. It beat earnings estimates in each of the trailing four quarters, the average being 123.7%. Micron has a long-term earnings growth expectation of 8.2%. It beat earnings estimates in each of the trailing four quarters, the average being 5.9%. Juniper has a long-term earnings growth expectation of 5.7%. It exceeded earnings estimates thrice in the trailing four quarters with an average positive surprise of 3.4%.